A friend is hunting for a new laptop bag and asked if I knew where to find something cool. Of course the suggestions I sent back included a healthy dose of orange. (My own laptop bag is a very functional black. I just want to live vicariously through her.) So for the daring among you, I present a few orange choices: the Half Circle case from Snap, where I'm in love with everything; the Jane Marvel laptop sleeve; the Retrostriper bag; and the Melissa Beth bag. 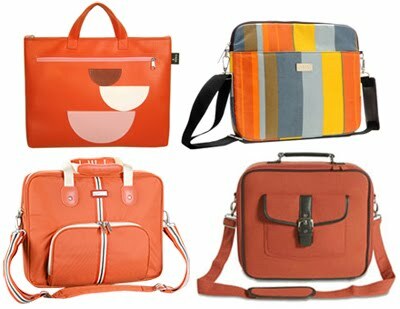 If you're too bashful to carry a bright orange laptop case, no worries. These shops have many other stylish color and design options for you. Ah, love! Mine is bright orange. :) It's this one. There's nothing better than a big dose of color in a traditionally blah space. Jennifer, I commend you on your oranginess! Well done! I love all of these. I need a laptop so I have an excuse to buy any of these bags. mine is a lime green and i love it. i could totally see getting an orange one too. i am so drawn to all of the wild laptop bags i see in stores. Is it navy, did you say? I think it would be awesome to do some orange topstitching and orange zippers or something. And maybe orange lining. See this gray one with the red details right here? I think it's so cool. Brown, actually... but a little orange contrast here and there would work! I like brown and orange. Excellent. I love incase products and suggest checking them out. I have this burnt orange Brenthaven case from Amazon and I looove it! See it here! Ooo, more options. Olivia, I love yours. Thanks for the link! just saw you mentioned in an interview with a featured seller on etsy. how fun! Those look cool. Nothing wrong with a splash of color. I have an orange bag from timbuk2 that i got a few years ago, it's not listed on their website anymore. And it;s a little worse for wear, maybe one of these will be my next bag!!! Thanks!!!! m, very cool. I like. Mary Catherine, that's fun--thanks for the link! And Kris, I'm off to check out your blog. Those are awesome for 15" laptops, but what about 17"? The big guys need love too! I have the oxio one. It squeaks after a while - all my friends who have it noticed it, too. Ah. Good to know. Not ideal. gorgeous finds as always, cutiepie! if i was rich i'd buy this.. Thanks for the link, Heather!